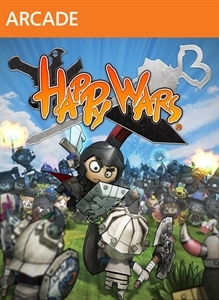 Happy Wars is a multi-player action game that pits different comic-style characters against each other in over-the-top combat arenas. Taking place in a variety of fantasy battlefields including grasslands, a dark world, and the ocean floor, players can control any of 3 types of characters: warrior, mage, and cleric. Cooperate with friends to enjoy action on a grand scale, working together to overcome enemies, casting magic spells, and attacking castles. For off-line fun, the player can take on missions in the solo campaign mode.